Ayşegül Çilekrenkli, a student in the Boğaziçi University Science Education Department, represents Turkey in the Dalai Lama Fellowship Program with the project she developed for the social and emotional development Syrian refugee children. Dalai Lama Fellowship is a global program initiated by the initiative of the 14th Dalai Lama, and aims to aid the personal development of social entrepreneurs from a variety of cultures, guide them to develop projects that will benefit people around them, and through these projects, to develop their ethical and leadership qualities. Ayşegül Çilekrenkli was accepted to the program this year, with a one-year project that she developed with the help of BU Education and Research Club (EREC). She is trying to find Boğaziçi University students who will volunteer to work in the project. Let’s get to know you, Ayşegül. I am a third year student at Boğaziçi University Science Education program. When I was a Prep student, I joined the Sailing Club; I took part in many activities for a year and a half. Then I joined the Education and Research Club (EREC). During that time, I also worked in the subcommittees of ILKYAR (Aid Foundation for Elementary Schools) and Boğaziçi Youth Center of EREC. ILKYAR organizes trips to schools in various parts of Turkey, taking university students with them, hoping they will be role models for the children. At Boğaziçi Youth Center, we help students with their lessons. In addition, we support Children’s Fest of Boğaziçi University Social Sciences Society (BUSOS). I also joined Scuba Diving Club recently. Can you tell us about Dalai Lama Fellowship? They define this program as “compassion in action”. They emphasize ethic values and aim to build a world that works for everyone. This is a completely secular program initiated in accordance with the wishes of the 14th Dalai Lama. The objective is to create an environment suitable for students from different countries and different cultures to discuss what they can do for their country and to design a project. They ask people to read some material during the application process. And eventually they want you to present a project. They promise to provide financial assistance and help you develop the necessary skills and viewpoint to run this project. In other words, the reading material is meant to help you to define a world based on caring and make it possible for this project to be of benefit to people around you by means of your inner development. 84 fellows have been selected throughout the word since 2011. Yes, currently we are reading the material on “Tilling the Soil” curriculum and writing commentaries on these texts. Afterwards we have weekly talks with our mentors over Skype. We also inform them of the progress we have made with regard to the project. We communicate via e-mail or Skype. While the project is going on, we hold yearly meetings. This year’s meeting will be on July 10-11 in San Francisco. Both last year’s and this year’s fellows will attend the meeting; we will conduct face-to-face group sessions also. Is this the first time a student from BU is participating in the program? Yes. This is the first time. Does only one person join from each country, or can more than one participate? They only allow one person per country. Could you talk about your project? The purpose of my project is the social and emotional development of Syrian refugee children in Turkey. 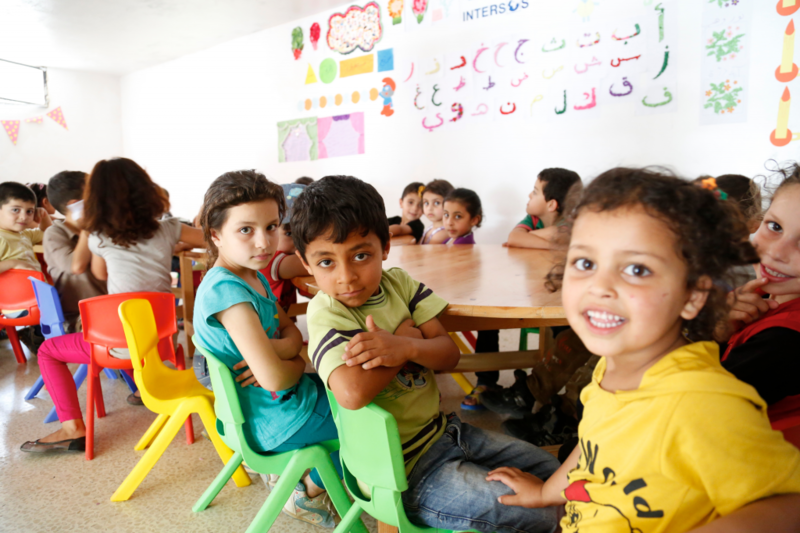 Some of the Syrian children in refugee status can attend state schools or private schools. For those who cannot attend school, there are education centers approved by the governor’s office or the Ministry of Education. In Zeytinburnu, which is the target area of my project, there are approximately 2,000 Syrian students attending temporary education centers. We try to bring those children together with university students by means of games, book/reading clubs, psychodramas, arts workshops, and short trips, trying to become role models for them. Moreover, we want them to know the culture they are in and improve their Turkish because of course the medium of education in their schools is Turkish. Thereby they are expected to gain strength to cope with trauma and discrimination, get rid of the feelings of isolation and become a bridge between their families and their environment, facilitating their communication with people around them. What is the amount of assistance you receive from the Dalai Lama fellowship and how is this budget audited? The budget is $6,000 for the first year. When I tell them I need money for the project they will transfer the amount I need to my account. We keep records and will present them at the end of the year. At the end of the year, if we decide that the project will continue with a little more support, the funding can be extended until the project can sustain itself. We may not need that additional support because we already have some other organizations willing to support us. Who will you work with in Zeytinburnu? Will there be any sort of partnership? How will you get assistance particularly with regard to the language problem? A Syrian family in Zeytinburnu controls 4 temporary education centers; they have nearly 2,000 students. They also work for the refugees in Germany and Hatay. We plan to carry out our pilot study in their office building. I don’t know if we will have partnerships on paper, but as long as we have the capacity and an adequate number of students, they will provide the space. Ultimately, with the permission of the Ministry of Education, we can use state schools where there are evening education programs. How do you think this program will contribute to you personally? Before I started the program, I had no idea about Dalai Lama Fellowship; I just wanted to try it. But once I started, the warmth and friendliness of the people and the support they gave me assured me that I had made the right choice. They provide very valuable assistance to people who want to transform their dreams into reality; they are very experienced in this. And also they take their work very seriously, and while they are working they also establish a good social environment. How many people are there in the program? This year, I think anywhere between 20 and 30. From which universities and which countries are those people? In the United States they mostly come from Ivy League Schools. Let’s not take only the situation in the United States as an example. There are participants from Ghana, India, Costa Rica, and Egypt. From Turkey, students from Boğaziçi University and Koç University can join. There are participants from different countries every year. Schools and countries vary depending on the project they select and they can support. What are you plans for after you graduate from BU? I would like to become an academician and be involved in education, while I also want to keep on with my involvement with the NGOs. If we can catch a momentum, the project will become sustainable with the help of our supporters. That is partially why I am focusing on the education of refugees for the time being. If there are people interested in this work but do not have the time for it, I would like them to know that we need ideas, too. Even though the visible part of the job may be doing activities with the children, any contribution to the development of the project is very important for us also.